Understandably, most people are a little lost when it comes to using command-line programs like FFmpeg. But don’t worry, I was there not too long ago, and now I’ll try explain as thoroughly as I can how to install it and start using it. So really, you’re doing yourself a huge favour by installing it, you just need a little help to get started. Head on over to http://ffmpeg.zeranoe.com/builds/ and download either the 32 or 64-bit Static version (depending on your system). Most modern computers are 64-bit, but just in case you’re not sure, it’s pretty easy to check. To make the download size nice and small, it’s compressed into a .7z file, which is just like a .zip file but smaller. Chances are you know exactly what this is and how to extract it, but if not, you’ll just need to download a program called 7zip which will allow you to unzip it. I know it sounds like I’m sending you further down the rabbit hole, but 7zip is another program you’ll not regret you installed. 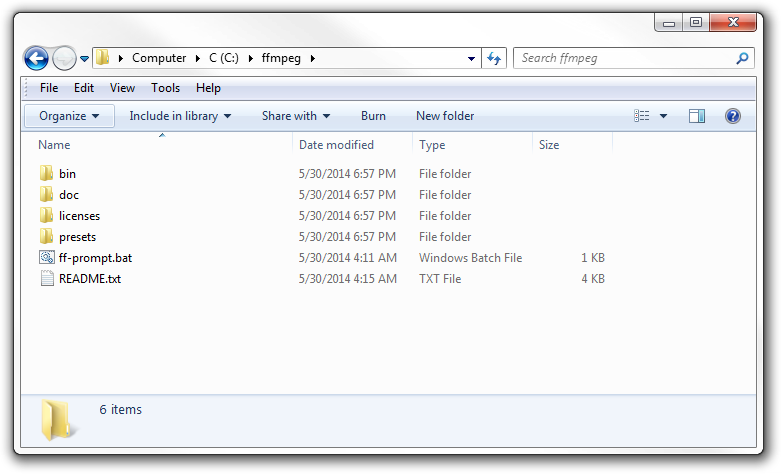 Unzip it to a folder that’s easy to find, like directly to your C:\ drive. It should create a folder like ffmpeg-20140530-git-98a6806-win64-static, but just rename it to ffmpeg for simplicities sake. You’ll thank me later. Finally, we need to add the bin folder, which contains the ffmpeg.exe file, to our system path to allow us to run the commands easily. but it’s much easier to type ffmpeg -codecs. If you try that right now, you’ll get an error saying that the ffmpeg is not recognized as an internal or external command. That basically means windows has not idea what you’re talking about. All we need to do is add C:\ffmpeg\bin to our system path, and it’ll understand us. So, in the Start Menu, right click on Computer and choose Properties. The Path is just a list of folders that contain commands you’re allowed to use without typing in the full path of the exe files. Since FFmpeg is a command-line program, we’re going to need to open a command line! 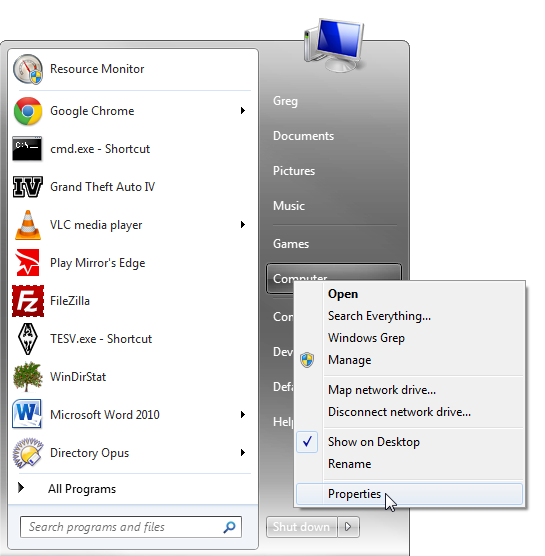 Shift+Right Click in a folder (without any files selected) and choose Open command window here. That’s what I usually do. 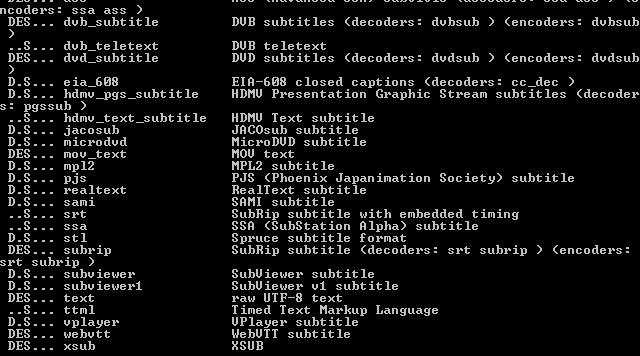 Once you’ve got a console open, check that FFmpeg is installed properly by typing ffmpeg -codecs, which will show you all the codecs you have access to, including audio and video. If it still tells you that it doesn’t recognize the command, double check that you successfully added the ffmpeg bin folder to the system path. If all is well – congratulations, it’s installed! Now you can play around with all sorts of things, like converting an image sequence into a video, a video into an image sequence, rotate and scale videos, discover information about a video, stabilize that shaky video you took at you Great Aunt’s 4th wedding, stream the webcam you planted in your girlfriend’s ex-boyfriend’s bedroom, or convert your 250 frame cube render to a super-crispy lossless h264 of unparalleled awesomeness. Thank you so much for the great tutorial you have shared on how Windows recognized this ffmpeg. Great help! I second daNi’s comments. I’ve flipped through many ffpmeg installation tutorials and this is the easiest to use for certain. Thank you! Hey Antony – your path should just include “C:\ffmpeg\bin\” (without the actual executable at the end). This tells windows to look in that directory for executables, you don’t have to tell it exactly which one you want. Thank You Very Much….. Great Tutorial!!! Need some more information, how to integrate FFMPEG in Harmonic Carbon Coder? Thanks, this was a well written guide. Much more helpful than the others I came across, too. Simple tutorial. Helped me a lot to take screenshot in recovery menu Android. FFMPEG was needed. Thanks a lot. Hi, I got ffmpeg to run. But ffmpeg cannot find my pictures and videos. Where should I place the files that I wish to use with ffmpeg? i put my files inside the bin folder and it didn’t work either. Just open the command window inside the folder that contains the files: deselect any files, shift+right click in an empty space inside the folder, choose ‘Open Command Window Here’; or just type ‘cmd’ into the address bar. Oh dear – well a quick google shows there are a few ways to get your old path back, and if those fail you can always just copy paste it from another computer to solve the worst of your problems. Maybe great tutorial, and certainly on a subject I need to know about, but I can barely read this page (all other web pages are fine – maybe some weird HTML settings?). That’s weird, it looks fine to me. Could you show a screenshot? and what OS+browser are you using? Thank you for the well written tutorial. Unfortunately, For some reason, I keep trying to open it and it’s still not working. I have the same problem. It says ‘ffmpeg’ is not recognized as an internal or external command, operable program or batch file. Thanks for Great Tutorial. but how I can play the video using ffmpeg? It’s a well-written tutorial, easy to follow. But when I tried to use it, there was system error message came out. so this is supposed to be one of the best Video tool and the installation is so shity why? I really appreciate your help and the tutorial. I am far from being any kind of geek and I am using ffmpeg to obtain music from Youtube via “Firefox”, “Youtube Enhancer”. Just as Feedback, there are two things that I found confusing on the tutorial. When I unzipped the program it was created under two ffmpeg files, therefore it is C:>ffmpegffmpegbin which I added to the path and it works well. I thought it was going to work straight from c:>ffmpeg -codecs and the tutorial shows c:>tmptmpffmpeg -codecs. Other than that I really really appreciate your help. God Bless you Man!! It keeps telling me that it is not recognized. I do not have a bin folder. You have to use the download link in this post. 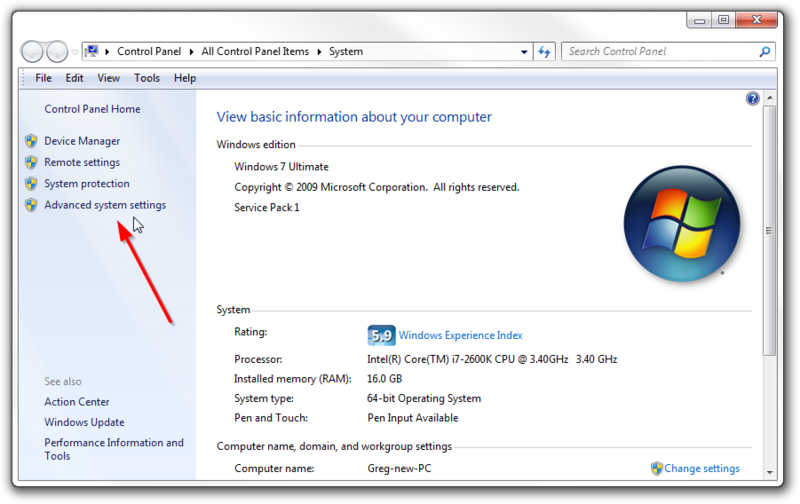 Search for “system environment variables” in the start menu. I have a .MOV file that was taken on a cellphone – it’s upside down. Can I rotate it 180 degrees in ffmpeg? How would I know if this has worked and has actually installed ffmpeg? See step 4 ;) `ffmpeg -codecs` should work, if not, then it’s not installed properly. Sorry, didn’t realize that Step 4 was collapsed. It just looked like: “Step 4: Use it! That’s it! If you weren’t successful, just post a comment below and I’ll help you out :)” Just realized what I had to do. Thanks for this explanation because the other ones were daunting and not particularly clear or helpful. Thanks again. Don’t suppose you could explain this in XP? Sorry I don’t use XP, but it should be very similar. Is there a particular part that you’re stuck on? 7zip??? Forget it mate… stick to the standard built-in zip. Is it possible to implement ffmpeg into own browser? There are some libraries available if you follow the first link on this page. I have no idea about what you mean by “Add to Path”. How is that done on Windows 7??? Are there any error messages? What isn’t working and what did you try? I don’t know what does it exactly mean, but after restarting my comp and trying “ffmpeg -codecs” command in the cmd, i get this error message – “The procedure entry point _wfopen_s could not be located in the dynamic link library msvcrt.dll” Any help? P.S. : I’m using Windows XP Professional. Hmmm, sorry, I have no idea :( Maybe Windows XP is just not supported? What will I do if I do not have the PATH on the User Variable? I believe if you do not have PATH under “System Variables” then you just have to create it yourself using the “New…” button. Thanks for the help! The download on ffmpeg.org hadn’t worked for me, but this one did. thank you for the descriptive tutorial! it worked beautifully! I am getting the following after adding it to the path. What could go wrong? I am using Windows 7. I have installed as per instructions and the test “ffmpeg -codecs” works fine. I have created a series of frames and now want to make a movie. It generates a very small movie file that is just green. I get a working movie. I would be interested in creating an mp4 file, because I understand they can be much smaller than the mov files. Any idea what I might be doing wrong? Attached is a screen grab of the output when I issue the first command above. I get the same issue with libx264. It doesn’t seem to be complaining that libx264 and h264 don’t exist. It just produces a nonsense output. operable program or batch file.’ Any help? Are you typing in the full path to ffmpeg.exe or just typing in ‘ffmpeg’? The whole idea with the PATH thing in step 3 is to allow you to simply type ‘ffmpeg’ instead of having to remember exactly what folders it’s in. I actually got it. There was no ffmpeg.exe in the bin folder. How strange, did you figure out why? I’m using windows 10 and when i added the path, it didn’t work for me but, when i restarted it worked fine. Thanks! If you followed step 3 correctly, then you might just need to restart your PC for it to pick up the changes. I accidentally deleted the PATH in user variable, what do? There’s nothing you can do. Your computer is broken now. Couldn’t he have just avoid saving?, “Cancel” ? I got “The system cannot find the path specified.” What do I do? Nvm, I put it in the wrong place. I tried to use -silencedetect by the version recommended here but it seems that this function is not included. I was trying to download a relevant version of ffmpeg but the installation procedure seems different. Can you help me how to use this function(silencedetect) of ffmpeg? Even though i have installed it correctly. Any ideas how to overcome this? You’ll have to ask someone who knows Pencil. Maybe there’s a forum? [h264 @ 00000000006eb980] data partitioning is not implemented. Update your FFmpeg version to the newest one from Git. If the problem still occurs, it means that your file has a feature which has not been implemented. I got the codecs to load on the cmd but now when I go into a bot to get this to work, I can’t open the bot at all now. What did I do wrong? Thank you! This is a very good explanation. Thanks..Finally i found this. I tried and worked!!! can anyone show me how to combine video and image with this tool. it’s still not recognised… I don’t do that kind of manipulation very often, so I don’t know what’s wrong exactly. It’s not an application as such, it’s a command line program. You use it from a command prompt (Hit Win+R, type cmd and then enter). I already installed it. But how do I use it to encode my video? i added it to varibles in path in both system and user varibles. weird thing is, i need this for making a animation in python and in there it works. just can’t use it in cmd. I didn’t get the .bat file after I unzipped it. I did every step except adding to a system path. I added C:ffmpegbin to the end of the variable value under the environment variables. Not sure where I’m going wrong. What .bat file? There is no bat file. Does the PDF look the same when you open it in chrome? You don’t open PDF’s in Chrome. You open them in Adobe Acrobat or Acrobat Reader. I suspect the problem is that a mutant font was used for the text on the web page, one that has no equivalent in a standard computer, and that text is all that the PDF printer could interpret. It might be possible to reverse-engineer the web page by copying all the text into a Notepad document, pasting it together with the photos in some kind of page program like CorelDraw and print it from that, but that’s a lot of work. It would be simpler if you, Mr. Zahl, could print it from your original, using your own PDF printer, and making sure the fonts are included with the PDF document so it can be read and printed out. That’s a simple setting on your PDF-producing software. Or use a nice standard font like Times New Roman in producing the web page, but of course that ship has sailed. You can drag a PDF into chrome to display it there. The font hierarchy for this page is: “Open Sans”, “Helvetica Neue”, Helvetica, Arial, “Lucida Grande”, sans-serif – so, Mr Read, either this is some weird bug in an old version of windows, or old version of acrobat, or you have one of those fonts installed already in some incompatible format. Here’s a PDF I printed from chrome, it displays fine for me in both acrobat and chrome: http://blog.gregzaal.com/files/How%20to%20Install%20FFmpeg%20on%20Windows%20-%20Adaptive%20Samples.pdf – if it’s still broken for you, right click on the text on this page > Inspect > scroll down the css list and change the font-family to whatever you are more comfortable with and print it then. Alternatively, read the FFMPEG documentation and write your own installation guide. I thank you for the PDF. Sorry if I was irritated, but I’ve done desktop publishing for various organizations for the last 15 years. I have had to deal with PDF’s where people used fonts allowed for display but NOT for printing. And fonts they didn’t embed in the PDF. Fixing those for printing in projects is always problematic; it would be better if Adobe actually made Acrobat printers cheap, instead of sticking up the consumer. 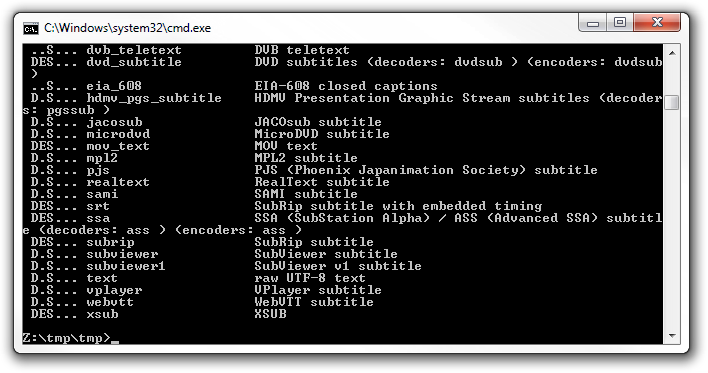 I still have problems installing FFMPEG, so for the time being i’ll stick with the slower conversion by Handbrake. Hopefully, IF simply changing a header allows conversion from the thrice-damned Matroska to a usable video format, I’ll try it again when I have time. My sincere thanks for you taking the effort, Mr. Zaal. I get the lovely error box below https://uploads.disquscdn.com/images/fa4b251068b33918c0879b999e3d540604b493321841eccda98e5392dc6def09.png . Have searched for a solution on the Web for this statement and there is no clear answer, except that apparently avdemux is also affected. Any suggestions? I would imagine XP and Vista are no longer supported, even microsoft no longer supports XP. In that case, should I go back and find an earlier version of ffmpeg where it was still supported? Any idea which version in the archives that would be?I don’t need “the latest and greatest,” just one that works. And I’m never going to change from Vista on my quad core, although my trusty old XP machine may be replaced soon by one using Linux Mint. Now in the command window it brings up the codecs. Haven’t tried it on my quad core Vista machine yet, but will try it someday soon. I’ve added the bin folder to the system path, but I’m still receiving the same message (unrecognized…..). What shall I do? Thanks in advance. Try log out and back in, or reboot. What do you mean on 3 C:ffmpeg and that, where should I write taht, doesnt worK!? Did you follow all the instructions? Just downloaded it again and it’s still the same as I remember – a zip file with bin, doc, licenses and presets folders, and a README.txt. Maybe download it again, or share a screenshot(s) of what you see. ntain what you described. I run windows 10 if that helps at all. Thanks! And I have tried to re-download twice. Hi Greg, thanks for the explanation. I am preparing a course in Python 3.6.2 for youngsters. 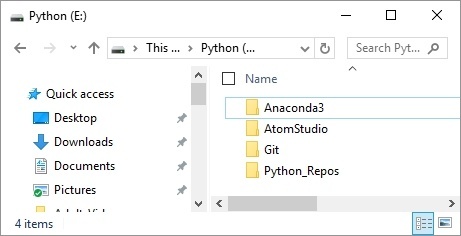 I use Atom for this and I installed all the files (Python & Atom) on a USB key. It works perfectly. Is it the same procedure than described above? ffmpeg will run from wherever you put it, though if it’s on a USB drive you probably don’t want to add it to your system Path and rather just call it directly using the full path. 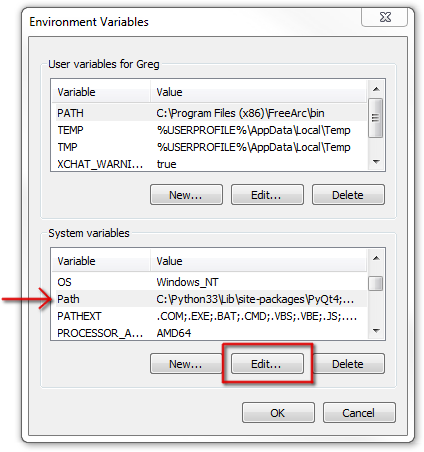 where as the path under System Variables is just for Windows/System32, Which one is the correct one to add to and then how do I verify it is installed correctly? I was told I can verify with ffmpeg -version. I tried adding to each path and both at the same time, but if I type in ffmpeg -version, i still get the ffmpeg is not recognized. Windows 10 is a bit different: In the start menu, click the little gear icon to open Settings, then in the search field at the top, type “Advances system settings”. Click on “View advanced system settings” in the results that appear. 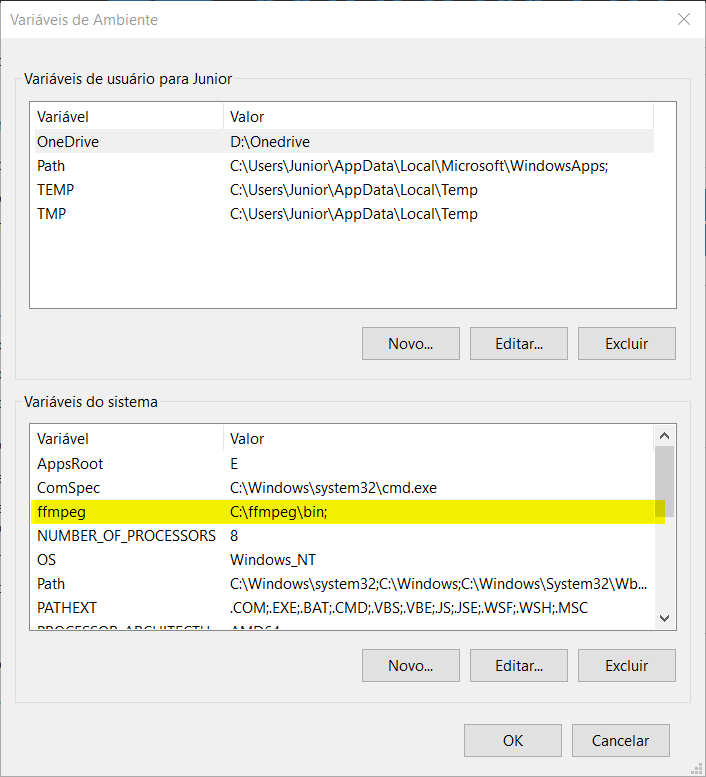 This will take you to the System Properties window. Click “Environment Variables”, then “PATH”, then “Edit..” as above. The window that then appears will look different. Instead of a single field named “Variable value:”, there will be a list of values. From here, click “New”, and type in C:ffmpegbin on the new line in the list. Click OK on that window, then OK on the Environment Variables window, then OK on the System Properties window. Each window will close when you click OK. And that should do it! Simple,easy and worked!! Thanks a lot! Got to the drop down under “Add to path”, then follow the directions there. Thank you, really nice tutorial. I installed FFMPEG and it worked fine. 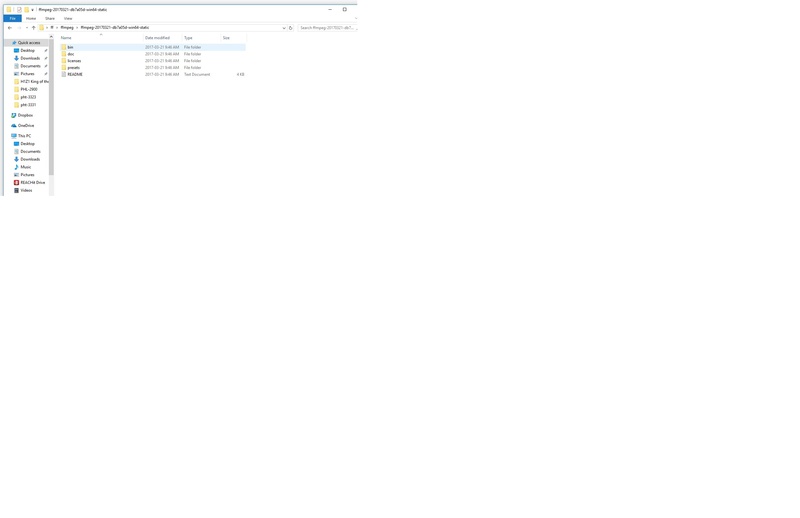 However, when I try to Enable Libx264, I get the message “Unrecognized option ‘-enable-libx264’. Error splitting the argument list: Option not found”. Can you please help me? I use Win10. Sounds like a bug, maybe download it again (which hopefully is a newer version with a fix), otherwise report it. 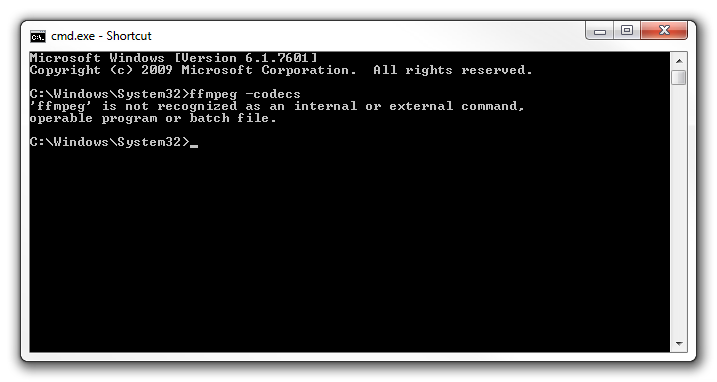 by Using ffmpeg tool can we convert any mp4 video file into ts stream or HLS stream ? I followed all the steps and I am still having trouble! Help me! Hi, I was led here because I wasn’t able to import ProRes MOVs into my Windows Premier in W10. I did the steps here, but nothing changed in Premier. Am I barking up the wrong tree? You mean Adobe Premiere? Either way, I have no idea. Premiere should come with all the tools it needs to run, you shouldn’t need to install anything else yourself. I could not get this to work, DOS could not find the path. Is there an installer? 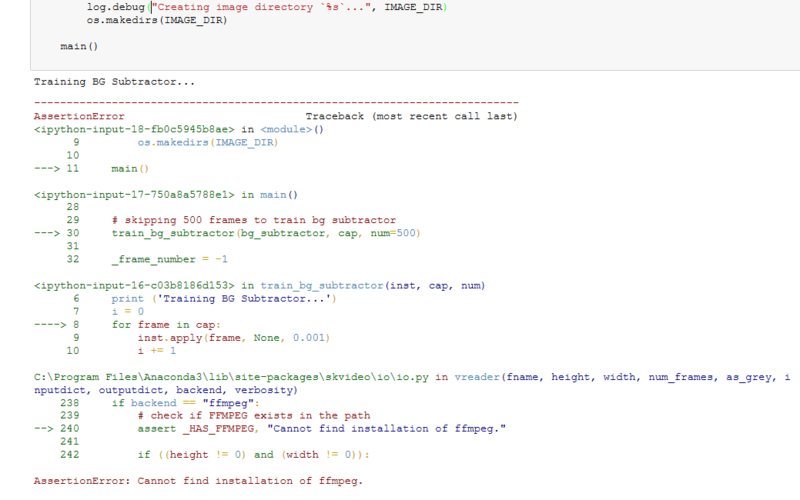 I have done all the steps, and ffmpeg -codecs shows all the files… But when I call ffmpeg inside python, I get the error message that no MovieWriter is available, or that I need to install ffmpeg. Can you think what would be the reason? 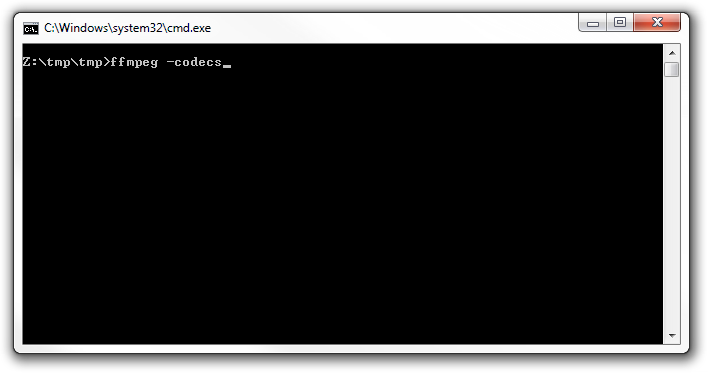 How to log the ffmpeg output to a text file through command. I am running ffmpeg commands through c# program but its not working. Followed the directions through “Add to path”. ffmpeg -codecs worked and all the files scrolled past. However, the “ffmpeg not installed” error message keeps popping up. There’s also no way to uninstall that I can find. So what do? what will be to command line to encode WAV to MP3 CBR 320kbps Stereo, having output codec “lavf” instead “lavc”? I have been using ClipGrab to extract Audio from youtube Video , Now it has stop . Does your program do the same thing as ClipGrab.? it all ends up to the same folder ! which files should go in what folders, or doesn’t it matter anyway ? and of course all the .ffpreset and ffprobe.xsd goes into the “presets” folder. It still shows that ffmpeg is not a regognized command. Idk why? It might be because it did not unzip as “ffmpeg” – mine was called “ffmeg-RANDOM-ALPHANUMERIC” … I just renamed it ffmpeg and it worked. Once I did that it worked for me. In the Path, don’t write C:ffmpegbin. Write where ffmpeg is. Where did you download it? In the builds, or in the main page? If you write Path in the command prompt, what does it write? I had to restart the computer for the path to be added. How to convert a video to mp4 … please ! Hi, will image acquisition software use the ffmpeg codec to encode video just by installing as described ? Hi, I’m having trouble with the Add to Path portion of this set up. How do I use/install this in python using pycharm IDE? Can anyone help me to solve this error? 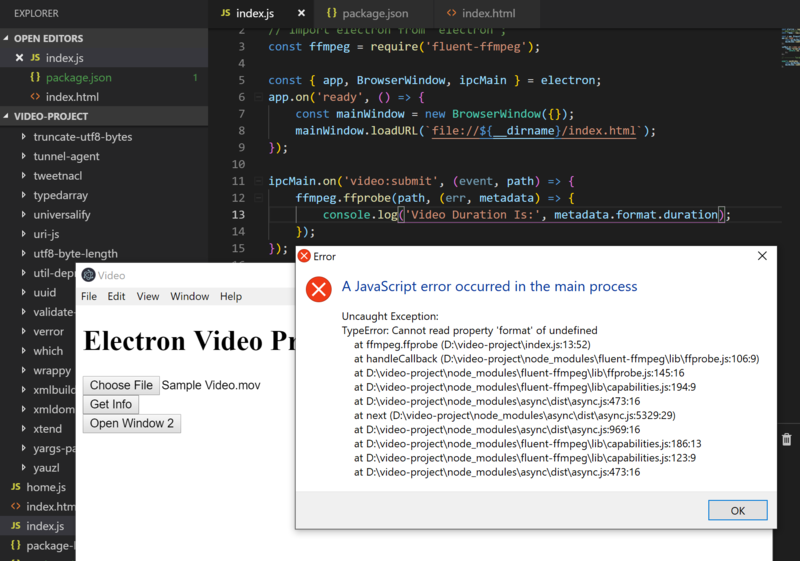 I installed ffmpeg-fluent in electron project and set the path on windows but still error found.